From Canada’s famous gold refinery and mint, and inventor of the Gold Maple Leaf gold coin, comes the MapleGram, the world’s first divisible gold coin multipack. 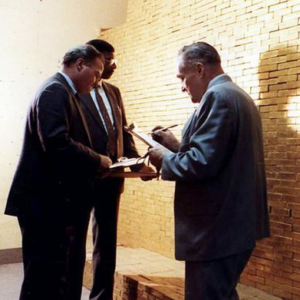 The Royal Canadian Mint (RCM), founded in 1908, is a Government of Canada Crown corporation and a member of the London Bullion Market Association’s prestigious Good Delivery List for gold. The MapleGram8 consists of 8 x 1 gram Maple Leaf gold coins, each individually produced from 9999 fine gold, and each sealed within its own transparent blister pack. The 1 gram gold coins come presented in a 3 x 3 square arrangement housed within a protective sleeve. The sleeve also doubles as the coins’ assay certificate, which is also signed by the chief assayer of the RCM. The obverse of the 1 gram Maple Leaf gold coin features a portrait head of Queen Elizabeth II, Canada’s official head of state, while the reverse of the coin features a stylish representation of a Canadian Maple Leaf designed by sculptor Walter Ott. A new security and design feature has also been added to the 1 gram Maple Leaf gold coin in the form of circa 50 equally spaced radial lines bisecting the gold coin’s centre. 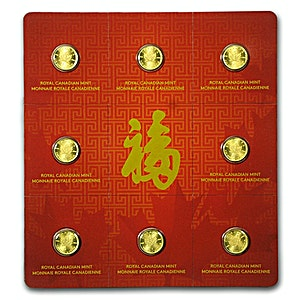 Each gold coin has a unique 8-digit serial number printed on the back of its individual blister pack, and each of the 8 segments can be detached from the main card, allowing individual gold coins to be gifted, sold or transacted with. Following the success of the MapleGram25, the MapleGram8 was launched using a Chinese theme of red and gold, signifying happiness and good fortune in Chinese culture. The presentation pack also comes embossed with a simplified Chinese character which means MapleGram8. In fact, the Royal Canadian Mint even decided on the number 8 since in Chinese culture 8 is considered to be the luckiest number and is a number associated with prosperity and wealth. Along with the larger MapeGram25, the MapleGram8 will offer its owner portability, divisibility and ease of storage, and is a stylish yet affordable entry point for investment gold coin buyers.